The areas most affected by Superstorm Sandy still haven’t made it to the state’s list of properties it will buy out and preserve to stop future development. 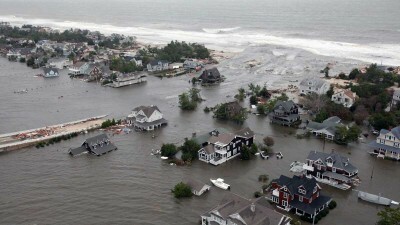 Most experts say that isn’t surprising since waterfront property owners in Ocean and Monmouth counties would ideally like to hold on to what they often consider prime real estate, but a well-known environmental leader in New Jersey says investigating buyouts in the Shore area could help the crisis of displaced homeowners nearly two years after the storm hit. The administration of Gov. Chris Christie announced Monday that the state will purchase about 200 homes in Woodbridge, Middlesex County, under the Blue Acres program. Blue Acres, mainly using federal storm recovery dollars, compensates homeowners in repeatedly flooded area for their properties and then preserves them from future development. But representatives from the state Department of Environmental Protection have said that in order to participate in the Blue Acres programs, entire neighborhoods – or, at the very least, a number of neighboring property owners – must be willing to participate. Though applications for buyouts have originated from towns including Brick Township, they’ve been more sparse than in areas along the bayshore of Middlesex County or in the Delaware Bay region in Cumberland County. “The governor’s plan is good for Woodbridge, Sayreville and parts of Middlesex County, but it is not good for all of our flood prone areas and our coast,” said Jeff Tittel, Director of the New Jersey chapter of the Sierra Club. Tittel, a longtime opponent of rebuilding in storm-prone areas that he says are subject to even worse future flooding due to climate change, said Monday that Mantoloking is a prime example of a location where Blue Acres funding should be used. Larry Hajna, a DEP spokesman, has previously said that while there have been applications to Blue Acres in towns such as Brick, Toms River and Seaside Park, they have been scattered in different neighborhoods, which goes against the program’s goal of using the open space created by buyouts – and subsequent demolition – of properties to better protect neighborhoods as a whole. Having a random open space in the middle of a street, officials have said, could end up producing more flooding issues in the end. Tittel’s position, however, is that the state should better fund Blue Acres so it does not have to rely on federal funds to operate, and create better incentives for homeowners to participate in areas which carry the most risk. In total, 306 families in six towns now have accepted DEP Blue Acres buyout offers, and there have been 154 closings in three Middlesex County municipalities: Woodbridge, Sayreville and South River. There have also been buyouts in Cumberland County. The administration’s goal is to buy out 1,300 homes statewide, move the families who lived there to higher ground, and create a better buffer against flooding for those who remain.